Regular check ups (also called Well Child Care) are important. Usually at a regular check up you find that you child is growing well and progressing like they should. That is so good to find out. But sometimes there is something that is not quite right. And when that happens you want to know as soon as possible. Dr. Jackson is noted for being very careful and thorough. After all, it’s your precious baby, and nothing is more important than that. 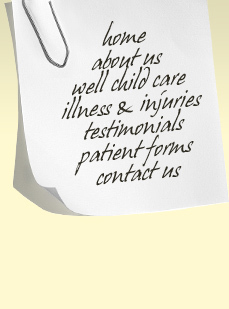 She takes the time to carefully examine your child and to make sure all your questions are answered.